Women voting, standing for office in Saudi Arabia. Saudi women registering to vote in the city of Jeddah on Aug. 30, 2015. Photographs of candidates – both male and female – are banned. Campaign appearances by women mean speaking from behind a partition, having male relatives or colleagues represent them or snapchatting and tweeting to their constituents. TV is off limits. Women still also aren’t allowed to drive in the country, and the Guardian says that women who have been involved in activism related to the driving ban have been prevented from running for office. 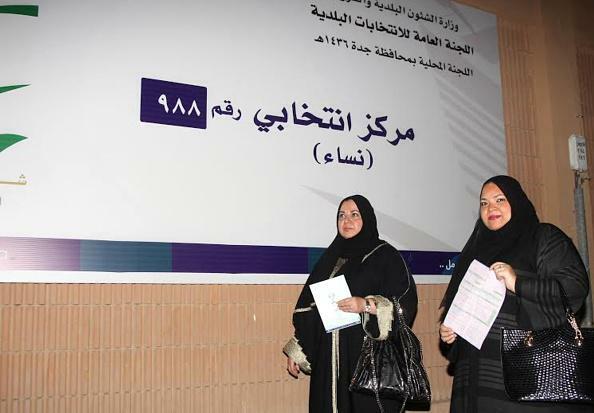 Some 130,637 women and 1,355,840 men are registered to participate in the local elections, which are the only opportunity of any kind for Saudis to vote and were held previously in 2005 and 2011. Though municipal representatives “oversee a range of community issues,” the AP notes, “all major decision-making powers rest solely in the hands of King Salman and the all-male Cabinet of ministers.” Baby steps!